It comes complete with ready-made amp/cab simulation settings for guitar and bass, including deep textures of bit crushed reverbs, bouncing delays and tremolos. 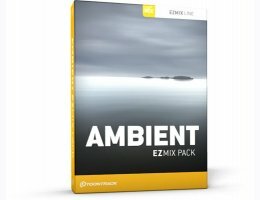 Also, in addition to its settings tailored for vocals and drums, the Ambient EZmix Pack comes with a selection of signal chains designed to work on any melodic instrument – be it piano, organ, flute or guitar. But of course – any setting can be applied on whatever audio source you may have. A richly saturated guitar preset might just be the perfect fit for your piano. Or a daunting, backward vocal effect may very well be exactly what you wanted for your bass drum. It’s just a matter of picking, choosing and being creative. Sweeping pads, flanged reverbs, slow, dwindling echoes – this truly is an inspiring set of tools that will add an instant new layer of creativity to any colorful, emotive or artistic expression.